100% cotton waffle texture towels with red or blue color border accent. 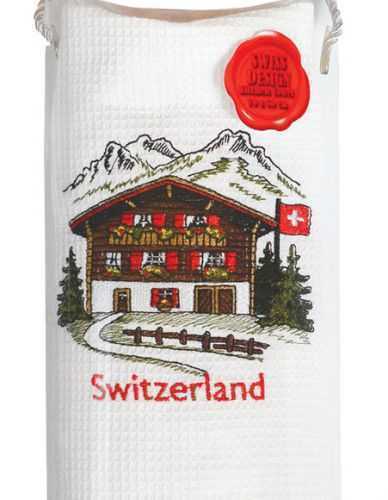 Three embroidered designs are available - Swiss Chalet, Alpine flowers, and Swiss farm scene. 20” x 28” towel size. Nicely packaged in a plastic gift box. Service Area: New Glarus, Beloit, Madison, Sun Prairie, Whitewater, Baraboo, Fort Atkinson, Roscoe, Platteville, Verona, De Forest and surrounding communities.